Fourth Row Center: Film Writings by Jason Bailey: In Theaters: "It Might Get Loud"
In Theaters: "It Might Get Loud"
In the ingenious opening scene of Davis Guggenheim’s documentary It Might Get Loud, Jack White McGyvers a makeshift guitar, pretty much just using a chunk of wood, a Coke bottle, and a piece of wire (“Who says you need to buy a guitar?” he muses). It’s a fine party trick, but it also sets the appropriate tone for Guggenehim’s doc, which is simultaneously reverential and irreverent, taking the art of rocking out with the appropriate degree of seriousness (which is to say, some, but not too much). 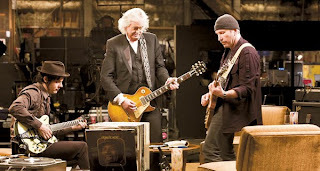 The film is built around a filmed meeting on January 28, 2008, during which “three musicians came together to discuss the electric guitar.” Those three were Led Zeppelin’s guitar god Jimmy Page, U2’s brilliant guitarist The Edge, and White Stripes/Raconteurs frontman White (who confesses, on the way, that he plans “to trick these guys into teaching me all of their tricks”). That meeting forms a through-line and jump-off point for the film, but less screen time is spent at it than you might think; much of the picture is spent on the three guitarists’ individual biographies and current working methods. Page takes the cameras to the house where Led Zep recorded their immortal fourth album, while Edge visits the secondary school where he and his mates met and first rehearsed and performed (he even finds the bulletin board where Larry Mullen posted the note that assembled the group). White is seen traveling and hanging out with a nine-year-old version of himself (it’s a bizarre contrivance that somehow plays; don’t ask me how). All three discuss and play recordings of the music that inspired (and continues to inspire) them; Page’s sheer joy of listening to Link Wray’s “Rumble” is only eclipsed by White’s emotional (yet eloquent) response to the music of Son House. An Inconvenient Truth director Guggenehim and editor Greg Finton jazzily hopscotch between the three biographies—all have great stories to tell, and the archival footage is priceless. U2 fans will eat up the vintage TV clip of the band; they seem impossibly young, though they look like old bluesmen when compared to Page’s first TV appearance as a kid skiffle player. There are aural treats as well, particularly a scene where Edge plays some old four-track recordings from the Joshua Tree sessions. That scene made this particular U2 fan just about pee his pants. However, if there’s one flaw to be found in It Might Get Loud, it’s that fandom might be a requirement; I love all three of these guys and have their bands on permanent iPod rotation, so for me, every anecdote was fascinating, every performance exciting. But more casual observers might find the film uninteresting, even dull. Then again, I don’t have much use for anyone who doesn’t like at least a couple of these guys. The summit of the great guitarists provides some wonderful, if controversy-free, footage. There are some clear philosophical differences between the three men, occasionally highlighted by the editing; Edge’s explanation of his love for effects units is seen as a direct contrast to White’s disdain for technology, while Edge’s list of the excesses of the rock era that preceded his includes a couple of items (like 15-minute solos) that Zep certainly indulged in. But observing the trio playing, listening, and talking shop, we reflect that it’s rare to observe this kind of powwow between skilled artists and craftsmen. Watching the three men jangling away at the power opening of U2’s early single “I Will Follow” is a joy; seeing them collaborate on Led Zeppelin’s “In My Time of My Dying” and the White Stripes track “Dead Leaves and the Dirty Ground” is downright thrilling. But perhaps the highlight of those scenes is the look on White and Edge’s faces as they watch Page play the signature riff from “Whole Lotta Love.” In that moment, and in the finest moments of Guggenheim’s documentary, we are reminded that true musicianship is not just about playing music, but hearing it and understanding it and, above all, adoring it; it is only then that, as White says, you can become a member of “that family of storytellers.” It Might Get Loud is a love letter to that family, and from it. "It Might Get Loud" is now in theaters. In Theaters: "No Impact Man"